If you have a spare 10 mins at some point over the next few weeks, it would be great if you could point your browser to: http://goo.gl/forms/iAMnGgft6eujpNea2. We're also collecting your views on the major current constraints towards more effective camera-trapping. I'll be in touch further with the group to field ideas we've been having in this respect - would be great to get some conversations going on this. Thanks for sharing the survey! Have you seen this new publication, 'Out on a limb: arboreal camera traps as an emerging methodology for inventorying elusive rainforest mammals'? Andrew Whitworth and team might have some valuable opinions to add if you haven't been in touch with them already. Otherwise, nice survey! I liked all the pictures you included and found it really quick and easy to fill out. How are your results going so far? Thanks for the link - I hadn't seen that, but am in touch with those guys. Great work they're doing. We've had ~140 responses so far, which is fantastic. Ideally I'd like to get somewhere near the 200 mark, especially given the vast number of people out there using camera traps! I'd just like to re-iterate if anyone has any networks they can tap into, it would be great if they could pass the link on. In particular, we'd like greater representation from people working on the front line of conservation (NGOs, land managers, industry), and we'd also be keen to hear from those on the technology development side of things. I'm definitely interested! Just completed your form. Thanks Heidi - much appreciated. Here are some initial results from the survey (based on ~150 responses) - see below. Let me know what you think. Does it mirror your impressions? In particular, cost and security being the major impediments to more effective camera-trapping? Also, we've had a good amount of feedback on Bushnell and Reconyx cameras, but would really like to hear from you if you have experience of any other camera models (good or bad). You can review your camera here. We had two models. Maginon WK1 and Cuddeback AmbushIR. So far the Maginon WK1 picture quality seems to be poorer than the Cuddeback. It's so subjective though, it's difficult to be sure. But I would not recommend the Maginon. Hi! If you're looking for in-depth reviews about trail cameras, you should look at TrailCamPro.com. 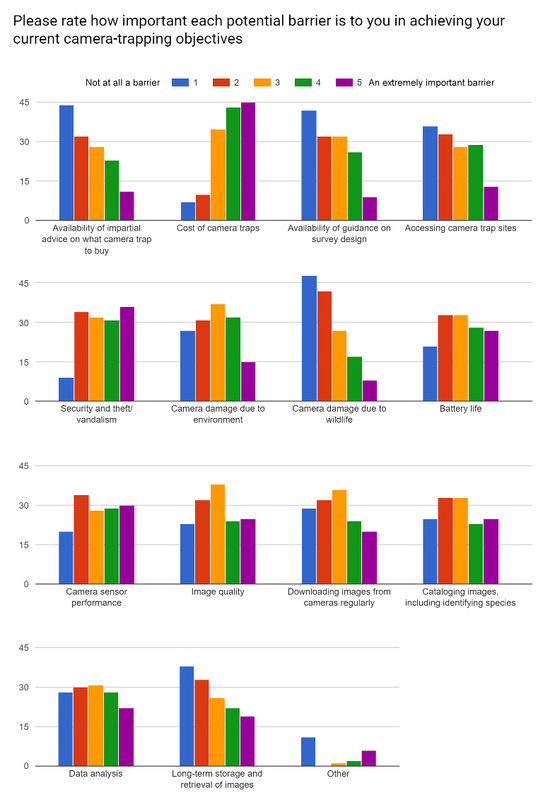 They test a whole bunch of relevant criteria that is really helpful when choosing a camera to buy! Generally their customer service is also great, so if you have any questions for them it's easy to contact them. Hi Katie - thanks for drawing attention to trailcampro.com. Their website is indeed a treasure-trove of useful information, but I'm loath to trust a commercial outfit, whose primary objective is to sell cameras. I am not saying their reviews are biased, I am just saying that the conservation community deserves a fully independent source of advice about camera traps! One step towards this might be to setup an online platform to allow camera-trappers to add their experiences of different camera trap models.